an Omani fabrication yard has taken another strong step forward in a sophisticated sector in the export market by delivering oil platforms to two Abu Dhabi oilfields. 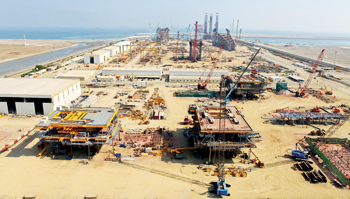 The Larsen & Toubro Modular Fabrication Yard (MFY), whose production facilities are in Sohar, delivered five gigantic offshore oil platforms for the Umm Lulu and Nasr oil fields in the emirate. Each of the five platforms weighed over 3,000 tonnes. Larsen & Toubro MFY has an impressive track record in delivering projects for the export market. These include the fabrication of an HB offshore platform for Maersk Oil Qatar and an FD-VII jackup rig repair and upgradation project for Foresight Drilling, UK. It has also accomplished fabrication jobs for several Indian projects. Among its ongoing jobs is the Zawtika field development project Phase 1A comprising three well head platforms for PTTEPI, Thailand. It is also working on major refurbishment and layup of the jack up rig Sagar Uday for ONGC, India. L&T MFY LLC is a joint venture between India’s Larsen & Toubro and Zubair Corporation, Oman. The yard possesses the capability to fabricate and load out a range of complex structures for the oil and gas industry such as large offshore process platforms, jack up drill rigs, SPAR/TLP platforms and modular process plants. With an annual fabrication capacity of 50,000 tonnes, it caters primarily to projects in the international market. Located in the Sohar Industrial Port Area, L&T MFY is an all-weather yard. It is the first of its kind in Oman, and has significantly augmented Oman’s industrial capability since 2007. The yard has state-of-the-art facilities for heavy fabrication and sophisticated equipment for testing and load-out of ultra-large structures. L&T MFY said the latest export once again demonstrated it was delivering on the vision to diversify the local economy and bring employment opportunities and benefits to Omani citizens. It added that the company’s objective was closely aligned to the national goal of growing local manufacturing as a cornerstone for future economic development while delivering growth prospects within Oman’s oil and gas sector. The offshore platforms produced at L&T MFY in Sohar provide a vivid illustration of how the high-tech fabrication of engineering projects and equipment in Oman can significantly contribute to the local economy in a meaningful and sustained manner, and add to the economic development goals of Oman, the company said. L&T is one of the few companies in the region to have set up a fully-fledged ‘Training Centre’ campus in Sohar. The centre provides an induction programme for Omani youth in batches of 40 individuals and conducts ongoing technical training on specialised fabrication techniques, including the welding processes SAW, SMA and FCA, thus equipping them with the skills and experience to work as qualified welders in the sector.